Oh my goodness you guys, I stepped so far out of my comfort zone on this makeover that I had to do it in the comfort of my pajamas. It's one of those you either love or hate kind of paint techniques. 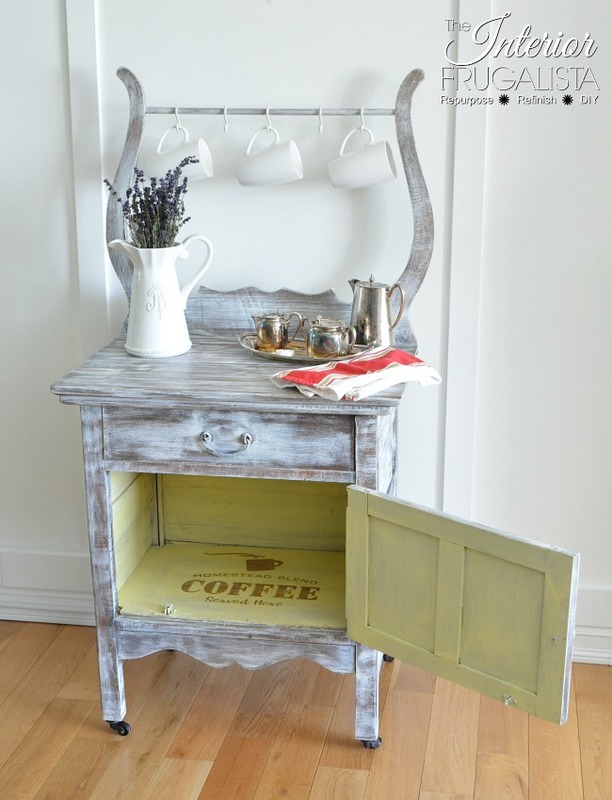 I personally love highly distressed or dry brushed painted furniture but I'm not known to do them. But this dang wash stand wouldn't accept anything less. Believe me, I tried persuading it to be more modest but it's been hanging around some very creative women for many years. I wish I could tell you where I got it but they'd have to kill me. Just know that it was surrounded by vintage movie cameras and film reels, and old brick walls and the drawer was filled with makeup. But the poor old gal was getting a little worse for wear. 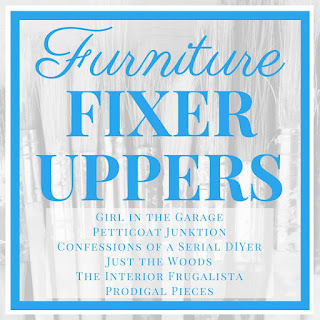 Before I get into all the juicy details, today is Furniture Fixer Uppers day, one of my favorite days of the month. 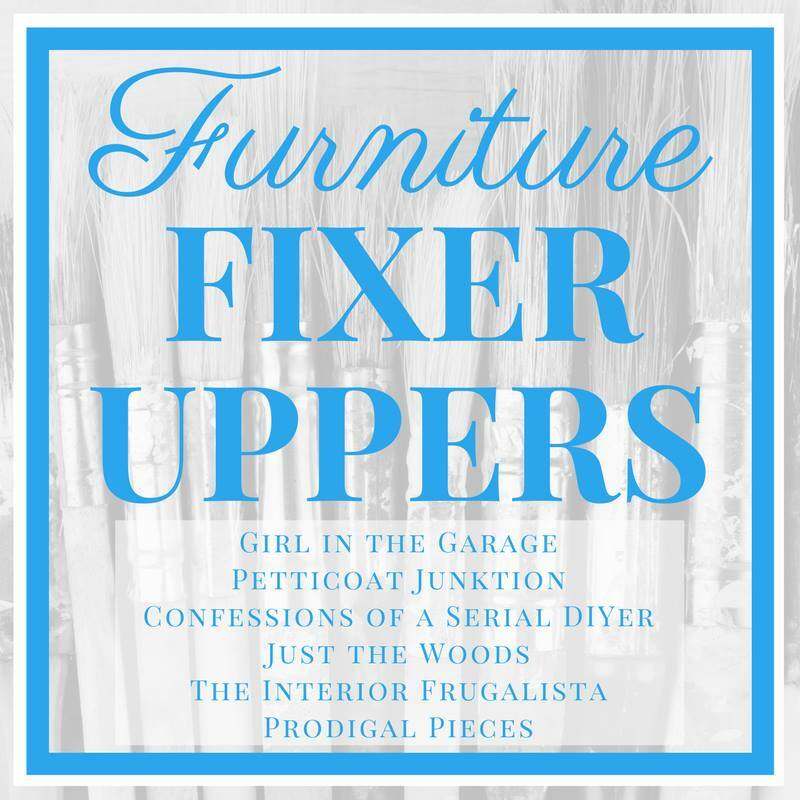 Six talented and creative bloggers coming together to breathe new life into six furniture pieces that had seen better days. 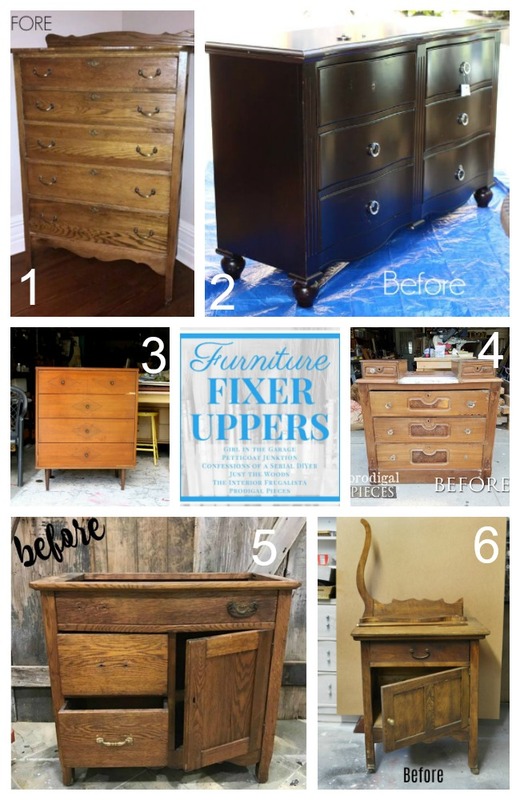 In case you missed last months challenge, I transformed Mom's Floor Standing Jewelry Chest and had a little fun with dollar store napkins. 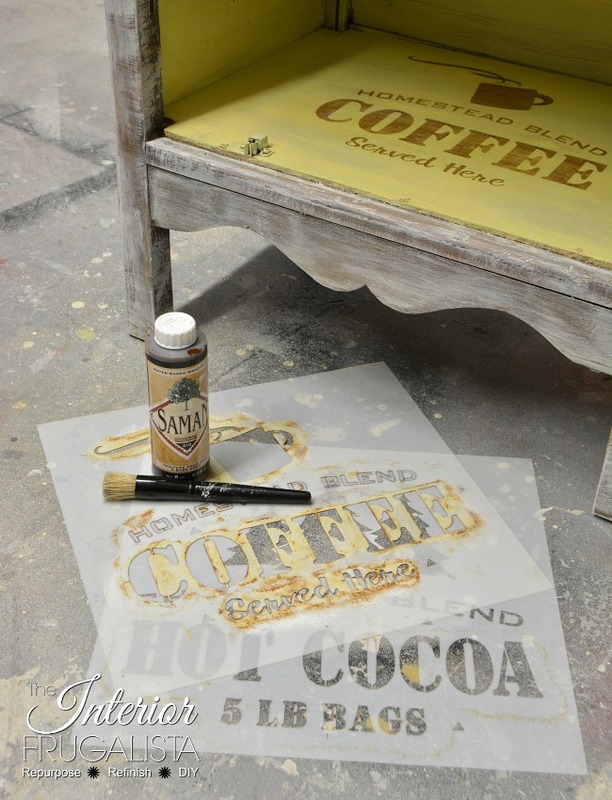 You may want to grab your favorite beverage because this post is loaded with photos, I'll wait. This piece is so old look at the casters that were on it. I've never seen wood casters before. Sadly two were missing so they had to be replaced. I kept these because you never know when they'll come in handy. To get a better look at the dry brushed paint technique, this is what the sides look like. 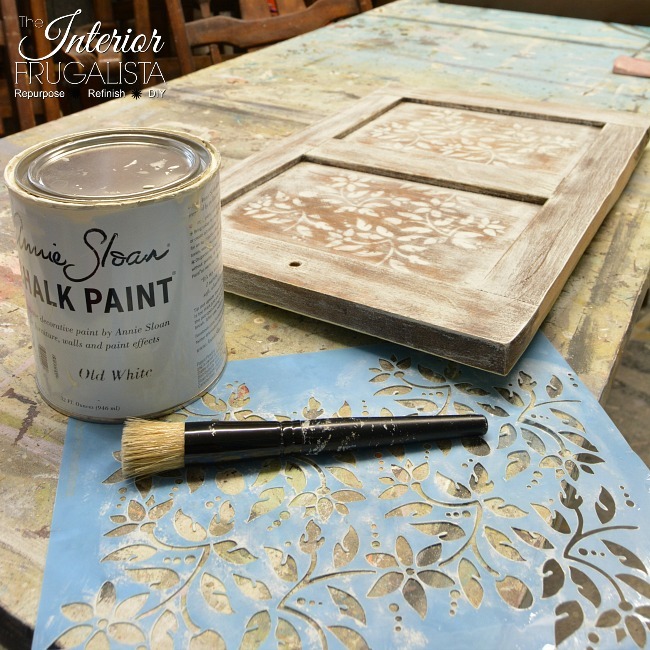 So all I did was dip the tips of my paint brush into Annie Sloan Chalk Paint in the color Old White and used long random brush strokes over the original wood. In areas where I loaded too much paint, I simply wiped the paint off with a wet rag. Easy peasy and finished so quickly. But before I started painting, I had to vacuum the cobwebs and give this old gal a much-needed bath in a 50:50 ratio of water and vinegar. Once clean the broken harp and trim pieces needed to be glued and repaired. Next, I got to work on the inside and I almost left it alone because it was so rustic and primitive. But again she would have nothing to do with it. She wanted to be bold and make a statement from the inside out. So we compromised and I left some of her rustic charm peering through. 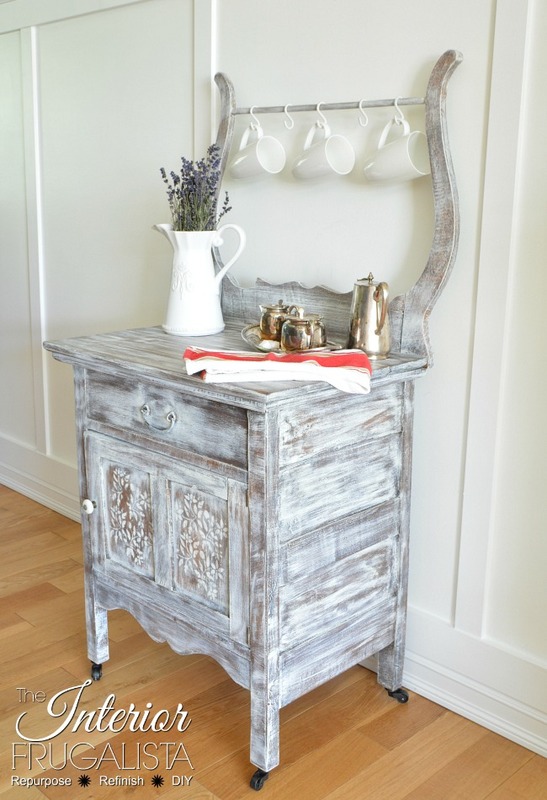 I used the same dry brush technique with the color Creme Brulee by Country Chic Paint. Those of you who have been following me know that I'm on a mission to use up all the paint in the workshop before purchasing any new cans. But of course, I couldn't stop there. 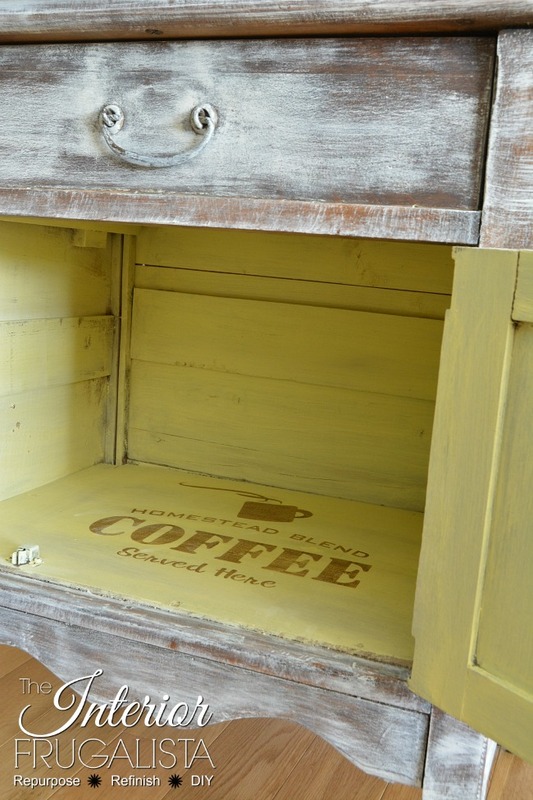 Because the plan is to use this Antique Wash Stand as a coffee station in our dining room, I pulled out my Homestead Coffee Stencil (not an affiliate link) from Funky Junk Interiors. 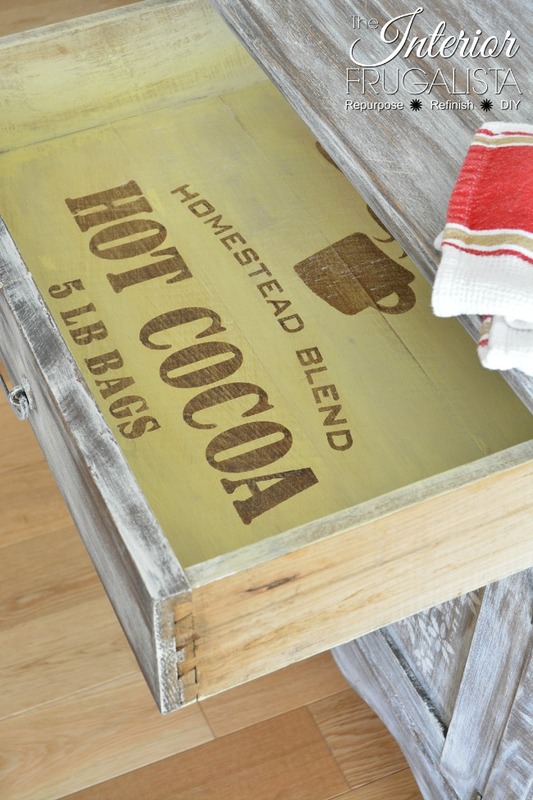 And I used my Hot Cocoa stencil (not an affiliate link) also by Funky Junk Interiors inside the drawer. 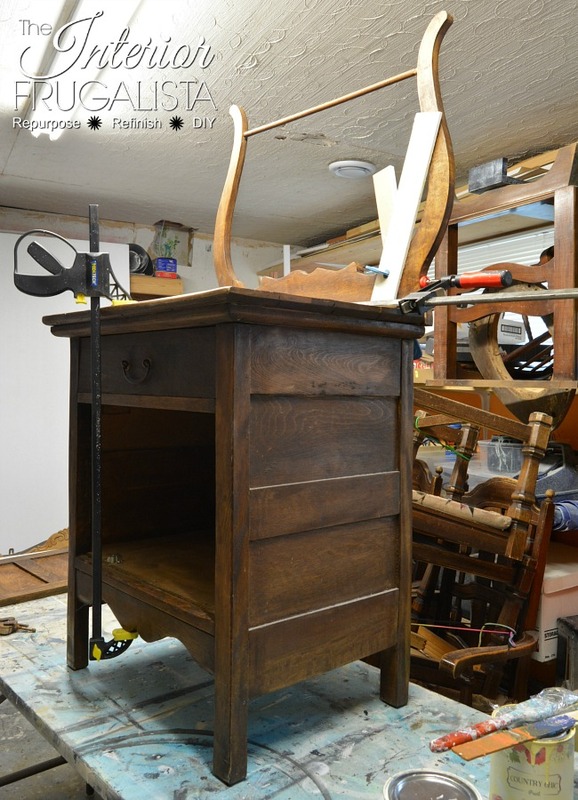 Check out those lovely dovetail joints too while you're at it. 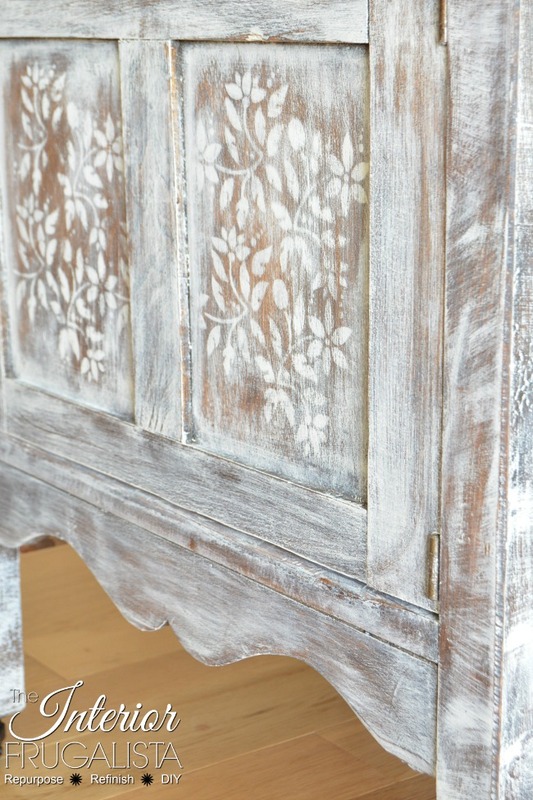 And so I used my Jacobean Floral stencil with the same Old White chalk paint. Then she shouted, "what about some jewelry?" 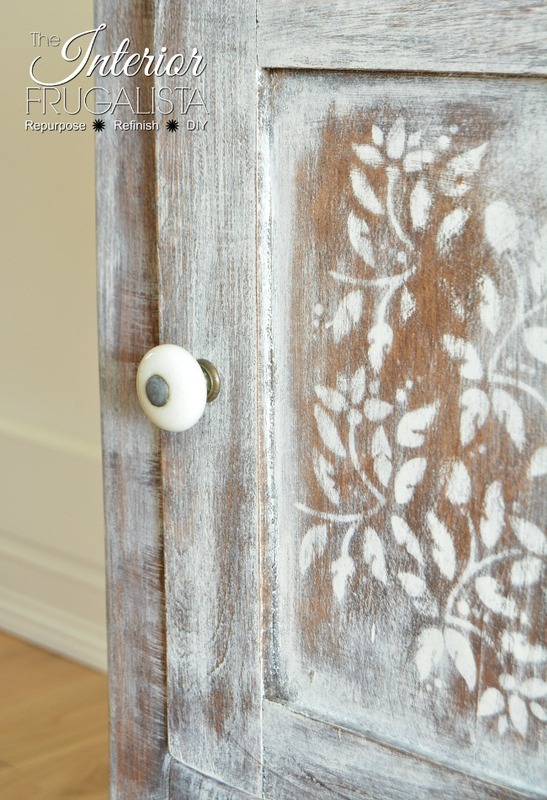 I wasn't a fan of the original knob and I question whether it was original to this piece. I replaced it with a classic white ceramic knob from my stash that I think is a lot more fitting. 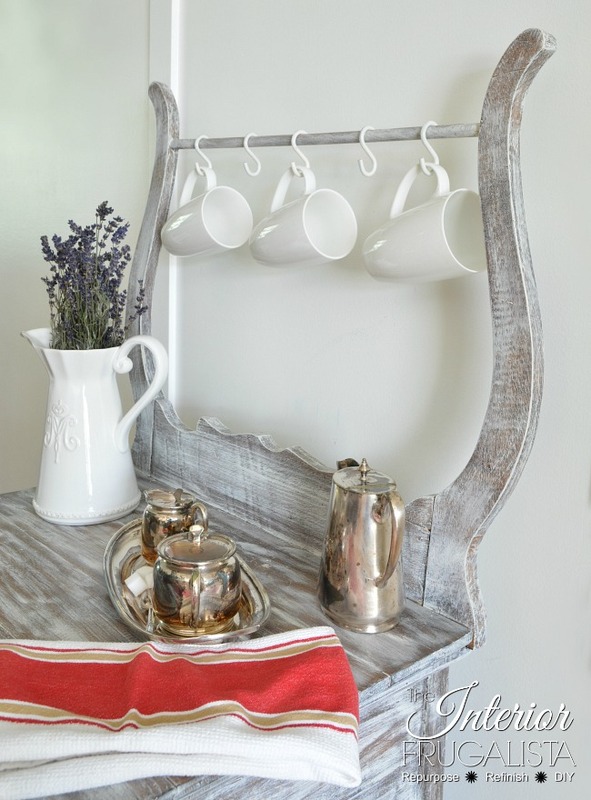 The entire wash stand, inside and out, was protected with creamy FAT Wax, a combination of beeswax/carnauba wax and it really brought out the rustic dry brushed finish. A gal who has been hanging around creative women and vintage movie cameras needs a harp. 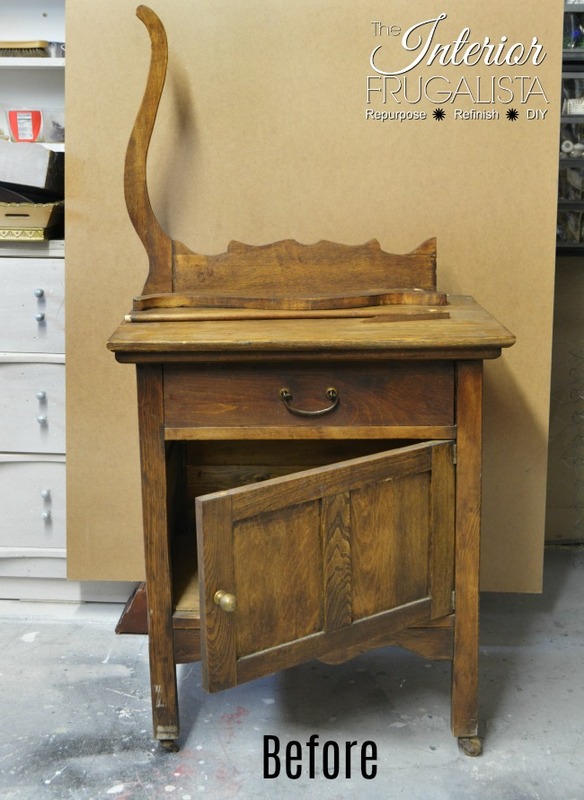 Here is a closer peek at the top of the Antique Wash Stand. 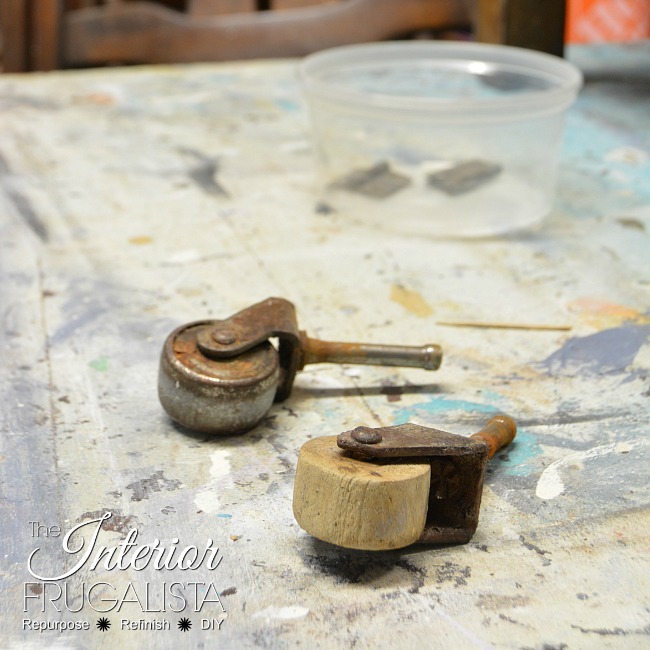 The original plan was to sand the wood and stain it a dark walnut but there were too many stains that could not be removed so it also received the dry brushed treatment. 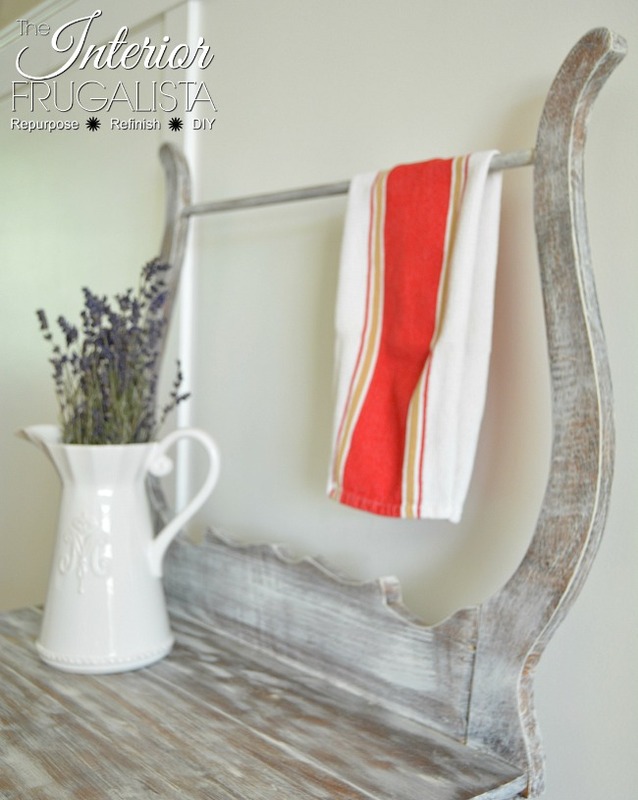 Have you ever dried lavender? 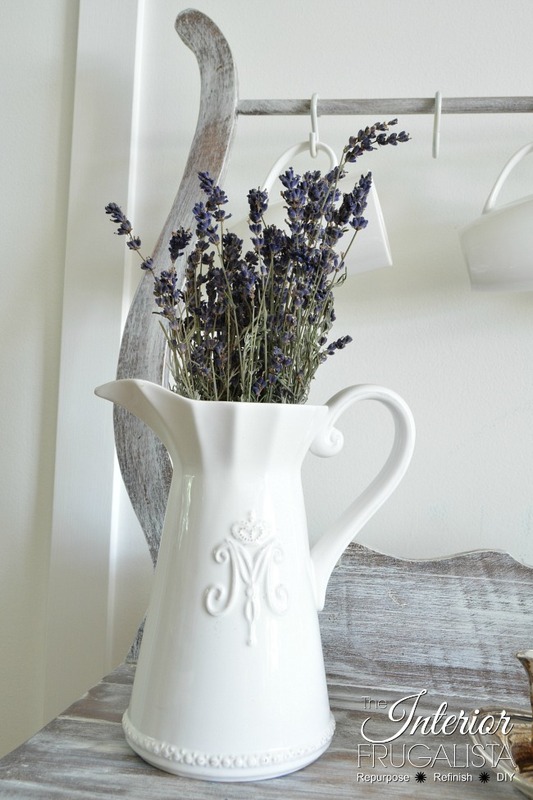 I harvested the lavender in the pitcher from my garden last year and shared a post about How To Harvest And Dry Lavender. 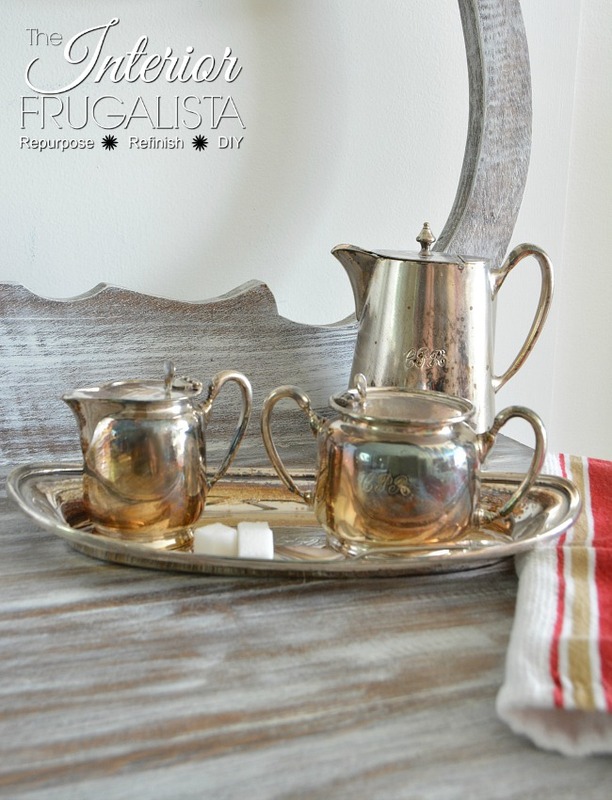 Mr. Frugalista is an avid collector of CPR (Canadian Pacific Railway) silver and I staged the photos with a few pieces from his prized collection. 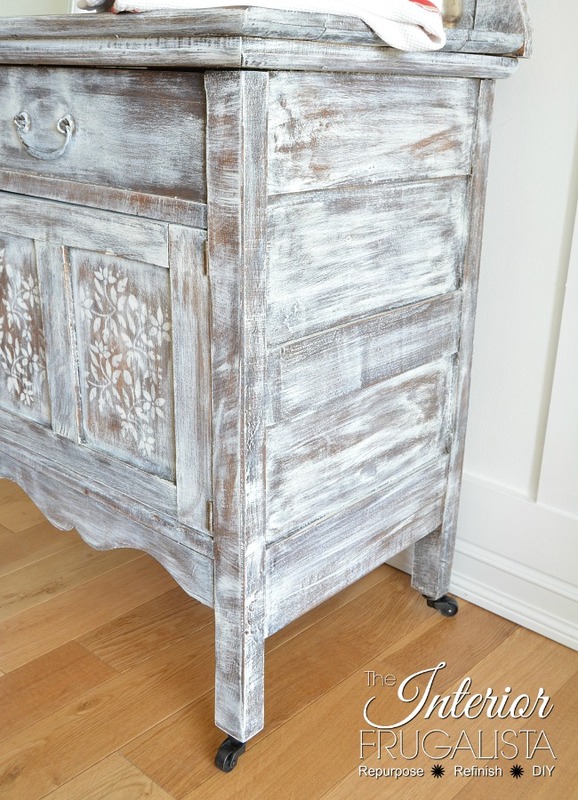 Last year I attempted the dry brush paint technique on another furniture makeover and you can see it here in my post, Carte Postale Queen Anne Desk. 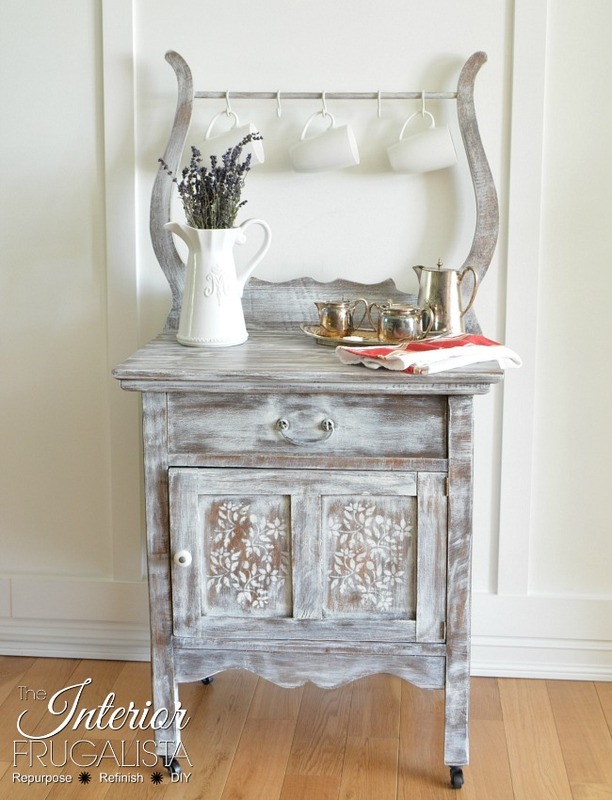 If you enjoyed this Antique Wash Stand Makeover, please share it with a friend and/or save it on Pinterest.